The imaginative universe known as Discworld is vast, varied, magical and hilarious. Terry Pratchett’s creation has developed quite an adoring following since the first novel was published in 1983. In 2001 he wrote his first novel for young adults. Naturally, that’s when I finally became interested. In all, Pratchett wrote six young adult novels which is only a fraction of the 41 novels overall. Five of these are about the young witch of the Chalk, Tiffany Aching, and her horde of tiny, blue, crude fae folk, the Nac Mac Feegles. Dressed in kilts and always ready for a fight, a drink, or preferably both, the Feegles are sworn to protect the “Wee Big Hag” and are always nearby, if unseen. In I Shall Wear Midnight Tiffany Aching is now all of 15 years old and officially the witch of the land. Although the people rely on her and she helps them with all manner of problems, once in a while a sentiment of fear and suspicion arises in the villages and witches are seen as a threat more than anything. Unfortunately this is where Tiffany finds herself now. Even the baron distrusts her, although she has been his friend since she freed him from the Fairy Queen when she was nine years old. It’s trying time for all the witches. Terry Pratchett had a particular knack for striking a tone between silly, insightful, and touching all at once. This book is no exception, though it is a little more touching than the earlier Tiffany Aching novels. Maybe that’s because we are also watching this little girl (who was already awesome and tough at nine) grow up into a young woman, full of self-confidence but also doubt, frustration, and confusion as she learns how to navigate the world as an almost grown-up. This series of books has been a great companion to me and I highly recommend it to any fans of fantasy, YA lit, or just great storytelling. When I was a kid, Friday nights was a sacred time. After the glittery disco spectacular that was Solid Gold (I only ever got to see the end credits, but that was enough to captivate me) came the greatest half hour of television. It was time for The Muppet Show. When Scooter pops his head through the door and announces, “Elton John? 15 seconds to curtain, Elton John!” (or whoever the guest of the week was) you knew everything would be fine for the next thirty minutes. The intro still fills me with the childlike glee I felt as a kid. And what better way to end a long day than with Muppets, music, and comedy? The Muppets was the best bedtime viewing imaginable. Now I am passing on that great experience to my son. Granted, a lot of it is extremely dated—I’m not sure he’s ever seen a variety show outside of the Muppet version—but the humor is still hilarious and Kermit, Miss Piggy, Gonzo, Beeker and the rest are as popular today as ever. We picked up season 2 from the library and started with Peter Sellers, one of my favorites. Taking his Dr. Strangelove character and bringing it into the world of Muppets is a mash-up I won’t be forgetting. If you aren’t into the old-fashioned stuff, I hear ABC is currently airing a new version, set in the world of late-night talk shows. I haven’t see it yet but if you have, please let me know how it is! I’m quite happy to watch the old Pigs in Space and Veterinarian’s Hospital. So if you are in the mood for a blast from the past and like to end your days with classic, timeless humor, you can’t do much better than some Muppet Show in bed. When it comes to sleeping, a comfortable temperature in the bedroom is almost as important as a comfortable mattress on the bed. If you find that you’re often waking during the night, you could be too warm. Body temperature shouldn’t rise when you get in the sack. In fact, to fall asleep and stay asleep, your overall temperature should remain cool. So if you feel warm in bed, heed these six suggestions so you can chill out when it’s time to snooze. 1. Stick your sheets and pillowcases into a plastic bag and place in the freezer for a few minutes just before you hit the hay. 2. 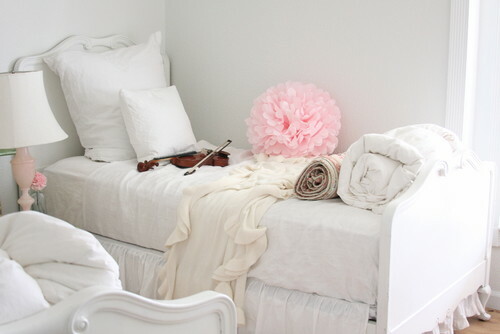 Wear cotton or silk bedclothes. Both fibers are breathable and more likely to keep you cooler than polyester. 3. Take a cool shower before you crawl in bed. Even a quick rinse might be enough to lower your body temperature. 4. Avoid spicy food too close to bedtime. For medical reasons, it’s also not a good idea to eat too late in the evening, but hot and spicy dishes could leave you feeling a tad warmer than you should. 5. Try a cooling pillow, which can help regulate your head and face temperature so you don’t get overheated and wake up before the alarm sounds. 6. Purchase a tabletop fan. Although many bedrooms come with ceiling fans, an additional fan on a nightstand or table can circulate enough air to keep you cool as a cucumber until morning. It’s so easy to make prepared hot cocoa – just stir a packet of mix into a mug of hot water and pop it into the microwave – you may wonder why I suggest you make your own. Well, truth be told, it’s not too much harder than the method just described. Yes, you have to dirty a pot and make a few measurements, maybe wait 5 minutes longer for the final product. But trust me, the end result is more than worth this tiny bit of extra fuss. This recipe mirrors the classic Hershey’s instructions printed on the side of the little brown box of hot cocoa mix. I’ve just added a little oomph by topping with whipped cream and cinnamon. Don’t stop here though. This recipe is merely the basic pattern for finding your very own hot cocoa mix, tailored just for you. Try using different types of chocolate – there is now a wide variety of cocoa offerings in every store. White cocoa is lovely, and you dark chocolate addicts can even shave a bit of your chocolate bar right into the milk before warming. I like cinnamon, but nutmeg, mace or allspice add a little punch, or you can even try a sprinkling of sea salt or a tiny dash of cayenne pepper for some serious spice! Sweeten the cocoa with brown sugar, honey, or caramel sauce. On special days, pour in a finger of whiskey, brandy or Bailey’s Irish Cream. Make a big pot of steaming hot cocoa for a large group (simply multiply the recipe times the number of people) or just treat yourself to a little something special. Homemade Hot Cocoa – so right for these fleeting autumn days, so right for breakfast in bed. Pour milk into small, heavy saucepan. Whisk in cocoa powder, sugar, vanilla and salt. Heat over medium heat, whisking occasionally, until smooth and thoroughly warmed. Pour into mug. Top with whipped cream and a sprinkling of cinnamon. I haven’t read books out loud to my son in a while, partly because a) He always has his nose buried in books on his own and b) He’s super into comic books and like I keep telling him, you CAN’T READ COMICS ALOUD. Well I asked him if he wanted me to read him a book (I am really good at it and have been depriving the world too long of my skills) and he grabbed a COMIC (maybe it was technically a graphic novel) called Dragon Puncher Island. That’s a good start. What a ridiculously silly title! What a ridiculously silly book inside! The most remarkable feature is John Kochalka’s style of illustration. Simple bright characters: monsters, dragons, superheroes, with what appear to be family photos as faces. The monster’s face is the author’s child and the superhero “Mr. Puncher” is a tabby cat’s face. The dragon from the sea appears to be the other cat in the family. What’s the story? Who cares? The monster/child has a super weapon he calls “Spoony Spoon”. It’s a spoon! The Dragon Puncher has little time for Spoony Spoon and the stinky monster wielding it. Of course while they are busy arguing, Spoony Spoon falls into the sea. And who should emerge just then? The cat-dragon! Whatever will happen?? This ridiculous book is pretty easy to read out loud even though it’s a comic book. Just come prepared with three silly voices to narrate it all.